Are you ready to clear the ONE" issue in the tissue" that is blocking you from receiving for your angels? or maybe you have always been curious about the other realms and are simply drawn to working with your angels and you’re ready to learn more. There are probably a number of reasons you have this issue right now. I’ve been there too! So don’t be so hard on yourself. Before I found the angels, I tried all sorts of things to try to get to the root of what was blocking me. First I tried to fix and figure it out all on my own and I often felt alone and exhausted. Then for a period of time, I forced new ideas or philosophies on top of my existing beliefs which created confusion and some self-worth issues. I also spent lots of time looking outside myself for compassion, validation and answers. Or maybe you’re situation is a little different , you’ve simply been looking to add a deeper, more spiritual solution to the good work you’re already doing for yourself. Or perhaps, you’ve secretly been yearning to connect with angels but it’s something totally new to you and you just don't know your way around using this spiritual tool. Whatever the case may be, if you’re anything like me or my clients, you probably were never taught that receiving from your angels was even an option for healing and growth. Until I met my own spiritual teacher, I didn't even know I had angels all around me who wanted to help. And I bet you probably didn’t know that angels are all around you and ready to help too! Yes, that’s right, Angels are all around you. You have at least 13 angels and guides that stand ready to assist you in relaxing, feeling peaceful, ready to help you releasing stress, transforming your thoughts and healing your body, mind and spirit… right now. You just need a little help getting started with this connection and some help trusting the messages you receive. The good news is, I'm excited to share that clearing the ONE "issue in the tissue" that you are experiencing right now is easier then ever with the help of your angels. Wholeness is at your fingertips with just a little mentoring and training. If I can do it and so can you! I teach a simple healing technique of aligning with angelic energy that helps you attune and connect to the Angels and their powerful, loving and healing energy. Once you are attuned to your angels, you can create a simple and powerful shift in your body, mind and any parts of yourself that you’d like to transform with an easy heart link to a very specific type of angelic healing energy. 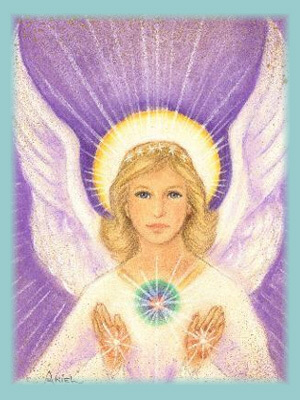 Aligning with and receiving this daily angel energy, along with the personalized 1:1 support I offer in my mentoring and healing work, you will have the personal power to shift, clear and heal this ONE issue that is blocking your from receiving the inner peace, empowerment and compassion from your angels. Imagine working with the angels and feeling supported like never before. It will help you transform, heal and move forward courageously and peacefully. So how do I know about the healing power of the angels and energy work? Let me share a brief story with you. Like you, I didn’t grow up with Angels and healing work. But it found me none-the-less. When I was 11 years old my father was murdered. I know. It's intense and it was a very traumatic experience. I carried the energy of grief, hurt, guilt and so much anger around me and within me for many years after the event. It was truly blocking me. However, this traumatic and stressful event at an early age put me on the fast track to spiritual growth. Unheard of at the time, I entered the healing field as a professional therapeutic massage therapist at the young age of 18. Shortly following my massage training, I became a certified yoga teacher as well. But soon enough, I noticed my massage and yoga work went deeper than most. My continued education in yoga and energy medicine training's opened my heart and mind to the unseen realm of energy and angels. I started to see and hear the angels and sharing this with my clients with great results. One day, while I was working Divine Healing Energy, I had a direct and deeply powerful experience with my own father’s spirit. Magically, the weights of grief, hurt, anger and guilt were lifted from me. I could see the higher perspective of his death and my growth that came from that trauma and struggle. I also realized he was always there as one of my spirit guides. I felt so loved and safe. After this healing, I knew I needed to share these energy gifts with the others because I became so happy, peaceful and whole. I knew that if I could transform the ONE thing that was blocking me, something so intense, and seemingly impossible to get over, with the help of Angelic Healing, other people could do so too. Other people could experience and create this happiness, peace, safety and love within themselves too. 20 years later, that’s what I do each and every day. I have put together all of my healing tools, experience and training into a one-of-a-kind, personalized Angel Healing coaching program that helps you heal YOUR one "issue in the tissue" that is blocking you from receiving, love, support and compassion from your angels today. I work with private clients from the cozy comfort of my Skokie, IL. home office and nationally via the convenience of telephone distance healing too. If you’re serious about transforming the ONE issue in the tissue that’s blocking you from receiving from your angels, I may be able to help. ​click the About Jill button to read my bio.